Nearly all plants on earth rely on mycorrhizal fungi to aid in their intake of nutrients and moisture. Many plants are extremely dependent and can struggle to survive without these beneficial fungi. For the most part, plants use the “Endo” types of fungi that physically enter into roots; while large trees such as pines and oaks use “Ecto” types that form a sheath around the roots. Plants and mycorrhizal fungi operate symbiotically as a single working unit in nature. The plant performs photosynthesis and other above-ground functions, and the fungi facilitate underground nutrition-gathering, water and nutrient intake, and protect the roots. These tiny fungi absorb nutrients and water and feed them to the plant in exchange for sugars. If present in sufficient numbers the fungi will keep roots white and strong. In just one handful of healthy soil there could be many thousands of mycorrhizal filaments at work absorbing water and nutrients to pass on to their plant host. Plants do not normally grow without at least some mycorrhizae in their root zone, and they certainly won’t thrive. Moreover, a lack of mycorrhizal fungi in the root zone is often the cause of disease and insect problems! 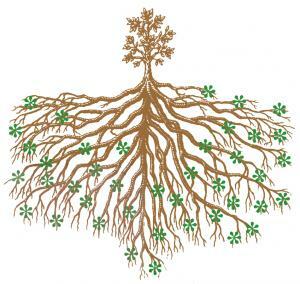 Soils are greatly improved by mycorrhizal fungi, sending millions of tiny root-threads far out from the plant roots. These root-threads separate clay platelets to allow essential air and water into the root zone, or will bind together sandy soil to form a moisture-holding biomass. In addition, marginal, salty, and damaged soils can often be made productive with the introduction of mycorrhizal fungi. Other important benefits of mycorrhizal fungi include enhanced rooting of cuttings, increased root generation, increased drought resistance, increased salt tolerance, reduced transplant shock, and enhancement of other valuable organisms in the soil. Mycorrhizae spores are dormant and float in suspension. They are not metabolically active and do not need oxygen until roots are present, at which point they will germinate and need oxygen and sugars from the roots in order to grow. One of the main functions performed by mycorrhizae is phosphorus uptake. However, when excessive amounts of phosphorus are present, the mycorrhizae will stop germinating. Therefore, it is important to establish thriving mycorrhizal colonization before the flowering phase. Once a healthy colony is established, mycorrhizae will be prepared for maximum uptake of phosphorus, resulting in larger fruits and flowers. Under certain conditions, some fast-acting liquid fertilizers can potentially harm microbial activity in the soil and create fertilizer-dependent plants. This is why some growers choose to apply purely organic gardening practices and use mycorrhizae in conjunction with other organic materials such as: bat guano, seaweed and worm castings. Taking this approach allows gardeners to eliminate the use of powerful synthetic nutrients, and instead create good populations of specific microbes that will take care of plant nourishment by utilizing an organically enriched soil. Biological/organic methods of gardening require more patience than crops grown with synthetic additives, as time to maturity is usually increased significantly. Ultimately, however, organics create plants that are more self-sufficient; usually requiring less additives to achieve the desired results. With only occasional applications of compost and trace minerals, an organic garden cultivated with mycorrhizae can render amazing results. And even if it appears that increased fertilization is needed, administer only light amounts of dry organic products that will release nutrients very slowly. To be sure, organic gardens do not display the dynamic growth and flowering of their synthetic cousins, but the end results are a superior tasting and more nutritious fruit. So be patient after the initial inoculation because mycorrhizal fungi spores will need several days to activate, attach to plant roots, and then colonize the surrounding soil before their effects become noticeable. Once established, however, this low-input biological approach to growing plants is clean, powerful, and sustainable. Moreover, soils will actually improve year after year instead of being depleted.